So, you have an electric skateboard ordered and arriving soon. If this is your first board, then there’s a couple accessories that you need and some that are nice to have. Casey Neistat, a vlogger and YouTube personality, is commonly seen riding around New York on his Boosted Board without a helmet. This is a huge mistake, and it’s unfortunate that he’s been a poor example for millions of viewers. Electric skateboards are dangerous. Full stop. The reality is, an electric skateboard traveling at 20 mph or higher has a serious potential to injure you. Without a helmet, a fall at high speeds can be life changing or even fatal. Experienced skateboarders know that falling on a board is not a matter of if, but when. You will fall, and you will thank yourself later when you can walk away from a wipeout with some scrapes or even just a broken bone instead of a concussion or permanent brain damage. Please, if nothing else, wear a helmet when you ride your electric skateboard. I literally never step foot on my board without one, and there’s definitely been a few spills where the helmet has saved me a trip to the hospital. Yes, a helmet is the only “accessory” that is something that I would consider to be required. There’s a lot of other safety equipment you can buy, however, that will minimize the injuries you receive when you fall. I would strongly recommend wearing wrist guards. These can be bought at any skate shop or online for less than $20, but like a helmet, can save you from a trip to the hospital. When you fall, you instinctually put your hands out to stop yourself from hitting the ground. Though this reflex might save you from smashing your face into the pavement, it means you’re putting all of that force from you falling into the tiny bones in your wrist. If you’re traveling slow, this might mean you get nasty road rash on your palms. If you’re going fast, you could easily break your wrist. 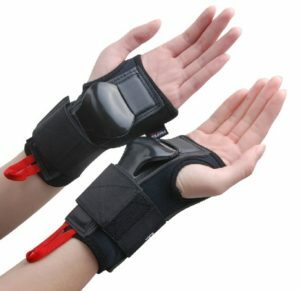 Wrist guards work by taking the force that would normally be transferred directly into your wrist, and moving it to a plastic piece that sits in front of your palm on a set of fingerless gloves. The plastic absorbs the impact by cracking, and better distributes the remaining force throughout the rest of your hand. Because wrist guards also are basically fingerless gloves, they can protect against road rash as well. In addition to wrist guards, elbow and knee pads help you prevent common skateboarding injuries. You can buy an inexpensive set of knee/elbow pads online or from any skate shop.